Music a boon to premature babies' health? CHICAGOAs the guitarist strums and softly sings a lullaby in Spanish, tiny Augustin Morales stops squirming in his hospital crib and closes his eyes. This is therapy in a newborn intensive care unit, and research suggests that music may help those born way too soon adapt to life outside the womb. Some tiny preemies are too small and fragile to be held and comforted by human touch, and many are often fussy and show other signs of stress. Other common complications include immature lungs, eye disease, problems with sucking, and sleeping and alertness difficulties. Recent studies and anecdotal reports suggest the vibrations and soothing rhythms of music, especially performed live in the hospital, might benefit preemies and other sick babies. Many insurers won't pay for music therapy because of doubts that it results in any lasting medical improvement. Some doctors say the music works best at relieving babies' stress and helping parents bond with infants too sick to go home. "What music therapy can uniquely provide is that passive listening experience that just encourages relaxation for the patient, encourages participation by the family," Klinger said after a recent session in Augustin's hospital room. The baby's parents, Lucy Morales and Alejandro Moran, stood at the crib and whispered lovingly to their son as Klinger played traditional lullabies, singing in Spanish and English. "The music relaxes him, it makes him feel more calm" and helps him sleep better too, Lucy Morales said. "Sometimes it makes us cry." Some families request rock music or other high-tempo songs, but Klinger always slows the beat to make it easier on tender ears. "A lot of times families become afraid of interacting with their children because they are so sick and so frail, and music provides them something that they can still do," Klinger said, who works full time as a music therapist but her services are provided for free. Music therapists say live performances in hospitals are better than recorded music because patients can feel the music vibrations and also benefit from seeing the musicians. 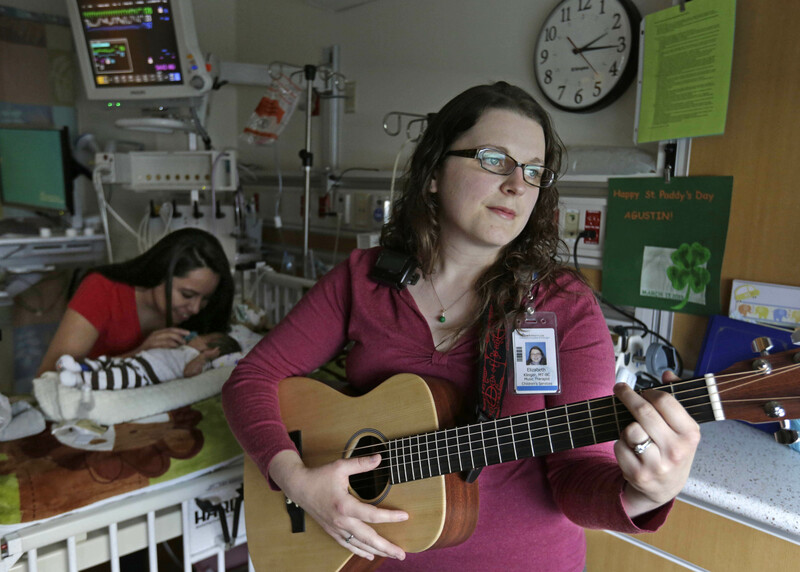 More than two dozen U.S. hospitals offer music therapy in their newborn intensive care units and its popularity is growing, said Joanne Loewy, a music therapist who directs a music and medicine program at Beth Israel Medical Center in New York. Preemies' music therapy was even featured on a recent episode of the hit TV show "American Idol," when show finalist Kree Harrison watched a therapist working with a tiny baby at Children's Hospital Los Angeles. "Music is such a huge part of our lives and to do something like this, make it a sort of healing process, is a cool thing," Harrison said on the April 25 episode. Dr. Natalia Henner, a newborn specialist at Lurie hospital, said studies in nursing journals show music therapy for preemies "does help with promoting growth. And there's some good literature ... saying that the time to discharge is a little bit shorter in babies who've been exposed to more music therapy." She said it "definitely facilitates bonding" between parents of preemies and other babies too sick to go home. Loewy led a study published last month in the journal Pediatrics, involving 11 U.S. hospitals. Therapists in the study played special small drums to mimic womb sounds and timed the rhythm to match the infants' heartbeats. The music appeared to slow the infants' heartbeats, calm their breathing, and improve sucking and sleeping, Loewy said. Soozie Cotter-Schaufele, a music therapist at Advocate Children's Hospital-Park Ridge near Chicago, says soothing rhythmic sounds of music can mimic womb sounds and provide a comforting environment for preemies. She sings and plays a small harp or guitar, and says the sounds help calm tiny babies while they're undergoing painful medical procedures. Cotter-Schaufele said she recently heard from a woman whose daughter was born prematurely at her hospital six years ago. She had played the 1960s folk song "Today" for the infant. The mother reported her daughter "`still loves that song," She said `She didn't learn that song from me, she learned it from you,'" Cotter-Schaufele said.